Despite the international community unanimous voice in praising the elections environment on the Kingdom of Cambodia as conducive to free and impartial elections some interested parties desirous in seeding havoc and conflict, continued to raise questions and to try to falsely present the realities of the Kingdom. Twenty parties had registered for vibrant and democratic elections in Cambodia. The video ends with the stand that democracy in Cambodia is maturing and that no one can destroy it (the video can be watched here). This is a perfect example of balancing the rights to information and free reporting on elections in the era of fake news and is even more impressive as the country has experienced a series of scandals regarding fake news promoters in the Kingdom like PHNOM PENH POST and CAMBODIA DAILY, newspapers that where at the center of a host of controversy creating fake news and excelling in manipulation and propaganda of the lowest rank. Despite this unfortunately episodes the Government of Cambodia has decided to weight in and respect the rights of press and uphold the rights of information in the perspective of expected July 2018 national elections. The NEC press release said the Code of Conduct for Media contains requirements and prohibitions they must conform to. • Journalist associations, journalist institutions or independent journalists who wish to cover news on the electoral process can apply for registration directly at the NEC. Alternatively, they may download the registration form from NEC’s website. As of May 23, the NEC has issued press passes to 284 journalists from 35 media organisations – including 51 foreign journalists from 15 media outlets – to cover the elections. • For national journalists, the registration deadline is 10 days prior to election day, while for international journalists the registration deadline is 5:30pm three days before election day. • National and international journalists who wish to take pictures in voter registration stations and polling and ballot counting stations should notify the chief of the Voters Registration Task Force in advance. • Broadcasting news that leads to confusion and loss of confidence in the election. • Broadcasting news based on rumour or lack of evidence. • Using provocative language that may cause disorder or violence. • Publishing news that affects national security and political and social stability. • Expressing personal opinions or prejudice in reported events. • Interfering or disrupting voter registration, polling and ballot-counting processes. 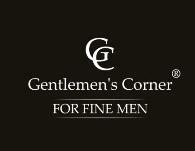 • Conducting interviews at voter registration stations, polling stations and ballot-counting stations. The new NEC regulations based on truth, ethic preservation and correct information management are perfectly balanced and destined to protect voters rights to privacy and information and to foster a responsible communication and reporting. making Cambodia`s one of the top countries in respecting press freedom and responsible journalism. General elections are due to be held in Cambodia on Sunday, 29 July 2018 to elect members of the sixth National Assembly. On May 29, the National Election Committee (NEC) has listed the sequences for all 20 political parties for the ballot paper to vote on the upcoming 6th National Assembly Election on 29 July 2018. President of Institute of International Relations and Economic Cooperation, Professor Dr. Anton Caragea held an official meeting with Prime Minister of Djibouti Mr. Abdoulkader Kamil Mohamed at the Prime Minister Office in Djibouti City. The delegates headed by President Professor Dr. Anton Caragea met Prime Minister of Djibouti Abdoulkader Kamil Mohamed and his government. 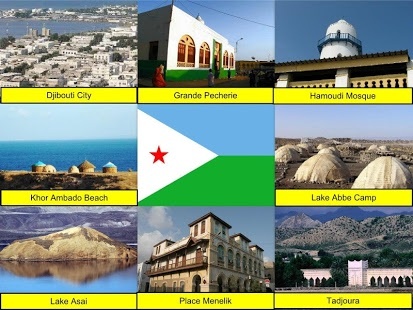 The dialogue between the two leaders was concentrated on the achievements that succeeded in placing of Djibouti as WORLD CAPITAL OF CULTURE AND TOURISM and ways to foster the image of the country, to promote cultural and economic exchanges and to boost the institutional cooperation between Djibouti and global tourism and cultural institutions. During the discussions President Dr. Anton Caragea tabled the agreements established during his visit such as: the support for candidature of H.E. President Ismail Omar Guelleh as GLOBAL AMBASSADOR FOR TOURISM AND SDG`s, the parliamentary cooperation for sustainable development goals, tourism and cultural cooperation framework established with the Ministries of Culture and Ministry of Foreign Affairs. Concluding the meeting and in carrying out the president Ismail Omar Guelleh instructions, H.E. 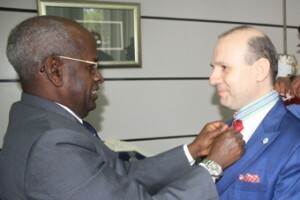 Abdoulkader Kamil Mohamed, Prime Minister of Djibouti had officially conferred upon President Dr. Anton Caragea the NATIONAL ORDER OF 27 JUNE on the highest rank. 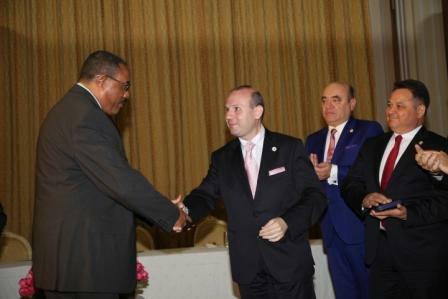 The recognition comes in fulfillment of lifetime achievements of President Professor Dr. Anton Caragea in developing an XXI century diplomacy, in promoting democracy and freedom and in the defense of peace on global arena has stated Abdoulkader Kamil Mohamed Prime Minister of Djibouti. The decoration ceremony has taken place in the presence of the governor of Djibouti, members of parliament and presidency and was live broadcasted. The high level dialogue was attended by the Minister of Culture, Moumin Hassan Barreh, the Minister Delegate for Trade and Tourism, Hassan Houmed Ibrahim, the Secretary General of the Presidency, Mohamed Abdillahi Waïs, the Chief of Cabinet of the Presidency, Mohamed Abdoulkader Ibrahim, the Director General of the National Tourist Office, Osman Abdi Mohamed, and high level delegates of the Institute of International Relations and Economic Cooperation. 2018 will be a year dedicated to the celebration of the christian heritage of the Romanian people and will also mark the latinity, continuity and the two millennia of Christian life on Dobrogea (Dobruja) by placing at the fore of national and international attention the sacred heritage of Holy Martyrs Epictetus and Astion, has decided the academic council of The Institute of International Relations and Economic Cooperation of Romania (IRICE). Saints Martyrs Epictetus and Astion are proof even today, two millenniums after their sacrifice on the long-term presence of Christian faith on the lands of Dobrogea and are a birth certificate of Romanian Christianity and an irrefutable evidence of the exceptional duration of Christianity on our lands. They are also a perfect example of sacrifice and life offered in the service of Our Savior Jesus Christ, has highlighted their significance Professor Dr. Anton Caragea – IRICE President. We are marking this year 100 years since the unification of Romania (1918 ) and we must also mark down for posterity our creative potential and not overlook that we are the beneficiaries of two millennia of Christian legacy and over 2.100 years of statehood, this are fundamental dates of the historical evolution of Romanian people. In this perspective, the Saints Martyrs Epictetus and Astion role is a fundamental one as we are speaking of the oldest historically proven martyrs of the Church on the territory of Romania, they are not only teaching us on the uninterrupted continuity of civilization on the banks of Danube, but also are offering us a lesson on the love for Christ of our people, even more resounding as we are having here saints registered in the Catholic and Orthodox pantheon so truly universal saints testifying for the Holy Church in his wholeness, saints that are making Romania proud of his legacy, concluded the historical presentation of the moment Professor Dr. Anton Caragea. The focal point of the celebrations for 2018 THE YEAR OF SAINTS MARTYRS EPICTETUS AND ASTION will take place on July 8, 2018 on Murighiol (former roman city of Halmyris) in the cathedral of Saints Epictetus and Astion with a special mass taking place in the honor of the holy martyrs of Christian faith and of Romanian dedication: saints EPICTETUS and ASTION. It is the celebration of the oldest holy martyrs known as the territory of Dobrogea, Epictetus and Astion, the Orthodox Church commemorates on 8 July. Description of life and their passion was kept in the Acts of the Martyrs with large details. They are known as saints Halmyris, the ancient Christian city located on the banks of the Danube that was called in ancient times “Almyra”. They suffered a martyr’s death during fierce persecution against the Christian church triggered by Emperor Diocletian (244-311) on 8 July 290. Surely they are the martyrs old Dobrogea certified undoubtedly springs hagyographic. Life and their passion have given in the Acts of the Martyrs, but unfortunately, their holy martyr act we were kept only in a later century copy. XV, located in the Church of the Saviour in Utrecht and was published in 1615 by Jesuit scholar Herbert Rosweyde († 1629). In 1921, Benedictine Dom Germain Morin discovered in remembrance of martyrology Ieronimian St. Epictetus and Astion on May 23 in “The S.S. Epicteto presbytero et Astion monachu martyribus Almiridensibus in Scythia “, confirming the veracity of statements he Acta Sanctorum, edited by N. Rosweyde, mentioned above. Saint Epictetus, priest, and Saint Astion, (improperly said) monk, originals from Asia Minor, were martyrs for Christ in the 3rd century in Scytia Minor (the today Romanian region Dobruja-Dobrogea, situated between Danube and the Black Sea). 2017 has marked a new height in the relations between Romania and Kingdom of Cambodia in the fields of cultural, development and tourism cooperation with the climax being the visit of Institute of International Relations and Economic Cooperation Presidential delegation (IRICE) in Cambodia between 1 to 11 December 2017. Institute of International Relations and Economic Cooperation President, Professor Dr. Anton Caragea congratulates the author of Cambodia`s economic miracle: H.E. Prime Minister Academician HUN SEN. The visit of the presidential delegation headed by IRICE President, Professor Dr. Anton Caragea has come in recognition of the incredible strides obtained by Cambodia in the field of tourism in 2016 and 2017 as WORLD BEST TOURIST DESTINATION. The visit of Institute of International Relations and Economic Cooperation was also in recognition of Phnom Penh as WORLD CAPITAL OF CULTURE AND TOURISM and in recognition of Prime Minister of Cambodia, Academician HUN SEN as the GLOBAL AMBASSADOR FOR TOURISM AND SUSTAINABLE DEVELOPMENT GOALS. The visit included a rich and diversified cultural program calculated to present to IRICE delegates the heritage, cultural and historical treasures of the Kingdom. The Cambodian Riviera is an incredible destination uniting history with splendid beaches with lush forest and balmy climate all year round creating an attraction pole for tourists appreciated Professor Dr. Anton Caragea IRICE President. Koh Ker as a 7th world wonder ! Koh Ker is a 7thworld wonder, a place of absolute awe and incredible spiritual dimension, a magnet for tourists worldwide. Tourism has become a part and parcel of the livelihood of these regions and a breadwinner for families, registered IRICE delegate Mr. Mihai Prundianu. H.E. Professor Dr. Anton Caragea – IRICE President receives the silver platter of Phnom Penh from H.E. Minister of Tourism Dr. Thong Khon. 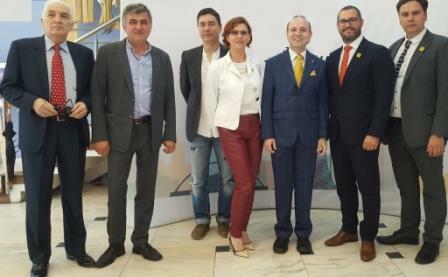 IRICE delegates held meeting with Ministers of Land Management and Development, Environment and have a long exchange of views with the Minister of tourism H.E. Thong Khon in a friendly and amicable atmosphere discussing new cooperation projects. Academician Mircea Constantinescu had also made public the inscription of Phnom Penh, Cambodia`s capital as WORLD CAPITAL OF CULTURE AND TOURISM, the world most prestigious designation for cities and regions of world significance and value. The visit of Institute of International Relations and Economic Cooperation representatives offered a new global standing for Cambodia on world stage and marked an ever developing bilateral relation that is rapidly transforming into a model for the region. A high-level delegation headed by Professor Dr. Anton Caragea, IRICE President will pay a ten day`s official visit to the Kingdom of Cambodia. The high-level visit comes in the context of an ever-expanding and consolidating bilateral relations and brings with it a new dimension of friendship between Romania and Cambodia. H.E. Professor Dr. Anton Caragea declaration to the Parliament of The Kingdom of Cambodia. After last year (2016) visit the bilateral relation has intensified with the opening of a cultural center in the Pitesti county, the inauguration of a bilateral chamber of commerce and in the follow-up on the agreements established last year the Khmer New Year was celebrated as a first in Bucharest and the Kingdom of Cambodia was awarded the honor of hosting WORLD TOURISM DAY for 2017 and 2018. Dialogue of friendship and solidarity: H.E. 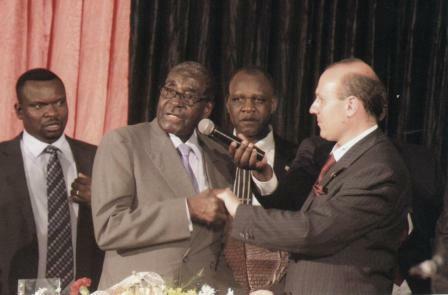 President Dr. Anton Caragea and H.E. Prime Minister Academician HUN SEN of Cambodia. For the official visit of the IRICE President Professor Dr. Anton Caragea, to take place between December 1st and December 11, 201,7 an all-encompassing program was carved comprising meetings with Cambodian Parliament President, Ministers of Tourism, Agriculture, Development and Environment with the highlights of the visit being the meetings with H.E. Prime Minister of Cambodia Samdech Akka Moha Sena Padei Techo HUN SEN and H.M. King Norodom Sihamoni. A special and complex cultural program was created for the high-level delegation led by IRICE President Professor Dr. Anton Caragea and includes stop-overs at the main cultural and UNESCO heritage zones of the Kingdom like: Preah Vihear, Siem Reap, Angkor Wat and Angkor Thom, Thailand Bay and the mysterious and celebrated Koh Ker. 2016: Professor Dr. Anton Caragea allocution to the Royal Government of Cambodia. On December 9, 2017, Professor Dr. Anton Caragea will have the honor of opening with a special allocution the celebrations dedicated to PHNOM PENH-WORLD CAPITAL OF CULTURE AND TOURISM. The inscription of Kingdom of Cambodia capital as one of the cultural and archeological landmarks of humanity it a central moment for the country stature as a world-class cultural hub in the region. Before starting his official journey IRICE President Professor Dr. Anton Caragea stated that his delegation attending this special moment in the life of the Kingdom is a solid proof of a consolidated friendship. This is a perfect moment to celebrate the achievements of Cambodia and to mark the inscribing of the capital city of Cambodia on the world`s list of cities leading humanity into a development and using culture and tourism as fundamentals for a better life for us all in a magister example, has underlined the significance of the moment in a brief statement H.E. Professor Dr. Anton Caragea.